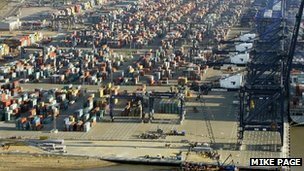 In June of 2012, investigators wearing gas masks in Britain’s busiest shipping port, discovered nearly 90 containers, each weighing more than 30 tons had arrived back in the Suffolk dockyard of Felixstowe. The shipments were part of a lucrative trade – about 10 million tons of waste metal that come out of Europe each year. When the Indonesian authorities inspected the contents of the British containers, they declared the cargo as hazardous, resealed it, and British authorities were ordered to arrange for its immediate return. The European Environment Agency (EA) is investigating four (4) companies to see if they sent contaminated and potentially toxic waste to the Indonesian capital, Jakarta, in spite of laws designed to combat a global epidemic of cross-border dumping. The team investigating the containers returned from Indonesia will pick through their contents to try and find evidence the waste metal, claimed by its exporters to have been legitimately-exportable scrap metal, was mixed with hazardous contaminants allegedly found by the Indonesian authorities. It is part of a wider picture in which millions of tons of material are shipped from the developed world to Asia and Africa, allowing criminals to profit by disregarding international rules and passing off illegally-exported waste as part of a legitimate global trade in recyclable commodities worth millions of dollars per year. The criminal trade, estimated to be worth at least $4,830,600.00 worldwide, ranges from hundreds of thousands of broken computers and televisions – so-called “e-waste” – sent to West Africa to be stripped of their heavy metals in unsafe conditions, to domestic waste smuggled out of Britain under the guise of recyclable paper or plastic. For more information, go to www.ban.org. According to the website, Lifehacker.com (and us), “If you’re looking to declutter a little bit, there’s no better way to do so than selling your junk online.” The site offers 10 tips and tricks for consumers to get the most money from their unwanted electronics. We take exception to one word in this article; “junk”. If the equipment is only a few years old, it’s probably not junk at all. Find out how much it’s worth. Make sure it’s in good condition. Securely wipe any data on your gadgets. Figure out where to sell it. Avoid coming off like a scammer. These are basically a simple version of the steps that we take for corporate IT assets. Most IT managers don’t have the time or resources to manage this kind of task in-house, as the disposal of a few hundred, or even thousands of assets can be a monumental task when not handled by a professional. So where does someone go who’s been tasked with the disposal of their company’s IT equipment, rather than just one or two of their own personal devices? Nobody goes to school to become an IT Asset Disposal (ITAD) expert and the answers can be confusing. E-Stewards has a directory to find an electronic recycler in your state and explains about the benefits of using an e-Stewards certified recycler. R2 Solutions also has a directory of R2 certified recyclers. Although the criteria is not as strict as the e-Stewards standards, R2 recyclers have demonstrated they have a system in place to properly handle materials according to the R2 Standard. The International Association of IT Asset Managers (IAITAM) has a best practices library, an online store, and a magazine- “IT Asset Knowledge”. A compound that is found inside of LCD screens could be a key component in medications according to researchers at the University of York. The specific compound is polyvinyl-alcohol (PVA), which is widely used in LCD TVs. LCD panels are typically incinerated or buried in landfills when they are no longer usable. The group of researchers has found a way to recover the PVA from the screens and turn it into a substance that may be suitable for use in tissue scaffolds to help the body regenerate. The researchers also say that the chemical could be useful in medications and other items to deliver drugs to a specific part of the body. The new technique that the researchers developed produces a product that is called expanded PVA. Expanded PVA is created by heating the LCD material in water using a microwave oven and then washing the material in ethanol. The reason that PVA is being looked at so closely for medications and other medicinal uses is that the chemical produces no response from the immune system of the human body. The anti microbial properties of the substance helps destroy infection caused by Escherichia coli and some strains of Staphylococcus aureus.